A maturity model is an excellent way of measuring and improving your organisation’s performance. It is also, if I’m being honest, my favourite performance management tool. 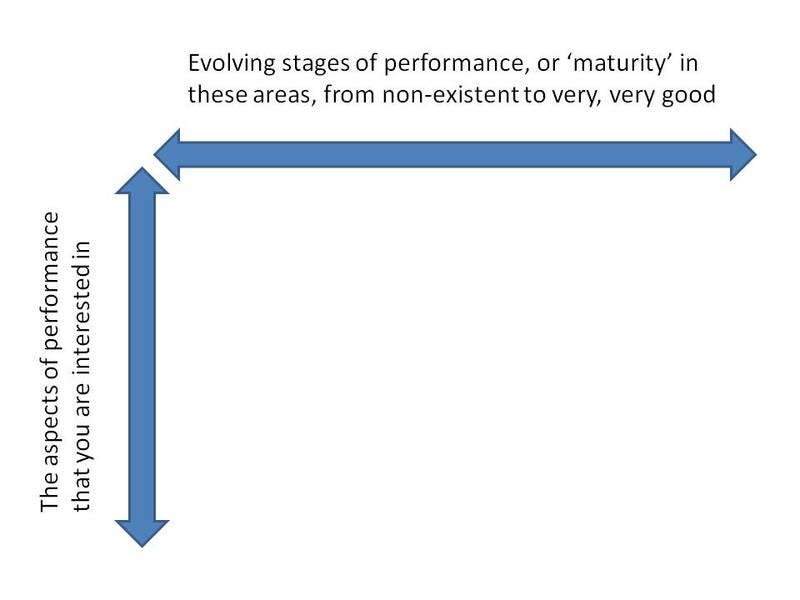 So here’s my quick guide to designing a maturity model and to making it work for your organisation. Maturity models work best if you apply them to a specific theme within your organisation, such as how you work with others, how you commission services or how you embed risk management into your activities. The more specific your focus, the more helpful the model will be in helping you to improve. Break down your area of focus into a manageable number of ‘aspects’ or elements, which will form the backbone of the model. These are the specific things against which you want to assess your organisation’s performance. It will take a bit of thought and research to identify the right aspects to assess, as you need to be sure that these are the things that drive performance in your chosen focus area. So if you are looking at how well your organisation manages risk, you might want to consider aspects such as training, risk assessment, risk appetite and risk reporting, to name but a few. Or if you are interested in partnership working, then you could focus on things like identifying potential partners, developing trust and sharing accountability. These aspects, once you have identified them, form one axis of the maturity model. 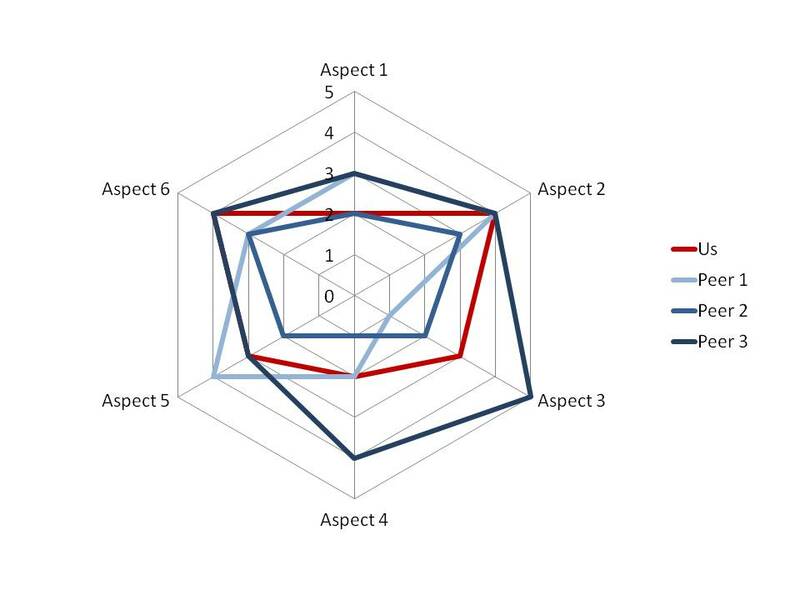 The other axis relates to your performance in each of these areas, as shown in the figure below. 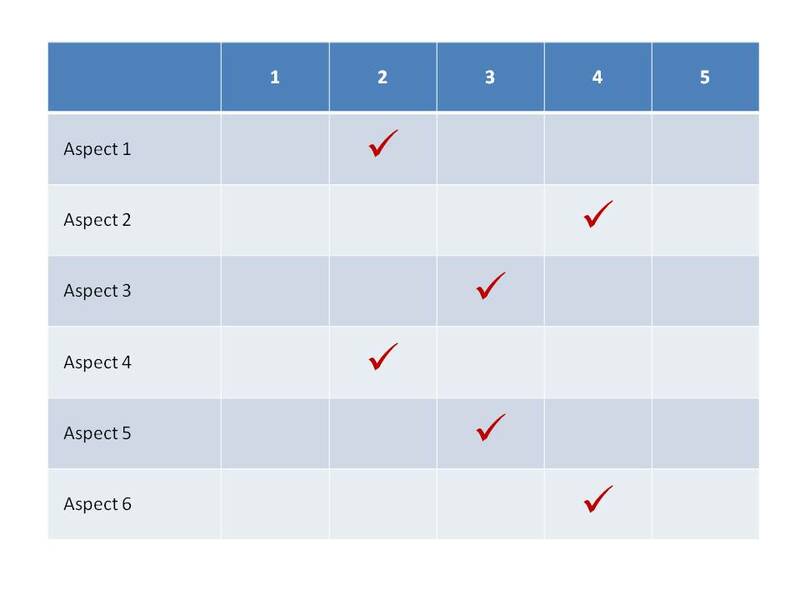 Having identified the main elements of the assessment, you now need to define the different levels of ‘maturity’ in each case. I generally advise having four or five levels, depending on how easy it is to differentiate between each one. In some cases, you either do something or you don’t, but generally there is scope for a more nuanced assessment. I usually start with the lowest level of performance, which I call level one. Technically, it’s level zero, but nobody likes being told that they’re at level zero, so level one seems a bit more diplomatic. Anyway, this is an easy level to define because it means that the organisation hasn’t done anything in respect of this particular element of the assessment. At the other end of the spectrum is level four or five, which represents the highest level of performance. This is much more difficult to define, as we need to strike a balance between a scenario that is (a) very impressive and possibly world class and (b) actually achievable in practice. It represents what the organisation could do if it worked on that element really hard for a sustained period of time. A bit of a ‘stretch’ target, if you will. The levels in between mark a progression from level one to level four or five. This can also be quite tricky, as there needs to be a clear distinction between each level. If you can’t find a distinction, don’t try to make one up. Just have fewer levels for that particular element. When defining the different levels of maturity, draw on as much advice and research as you can to make sure that your definitions are robust and represent best practice in your industry. If you don’t get them quite right, then you could end up using your resources to target improvement in the wrong areas. Of course I would say this, but it can be very helpful to get an independent consultant (or, at the very least, one of your peers) to help you develop the model, as they can give an unbiased view of what the different levels of maturity would ‘look’ like. At the end of this stage, you’ll end up with a model like the one in the figure below, though probably with a lot more rows and with descriptions in each of the boxes. Now for the fun bit. Having developed the model, you need to assess your own ‘maturity’ against each of the different aspects of performance. Or even better, get someone from outside the organisation to do it for you. If you are involved in a peer group of some kind, then you could all assess each other’s performance. This way, you are more likely to get an objective assessment than if you do it yourself. If you find that you’ve scored level five for everything, then you may need to revisit some of your definitions. Or you really do work in a totally excellent organisation, in which case ‘congratulations’! 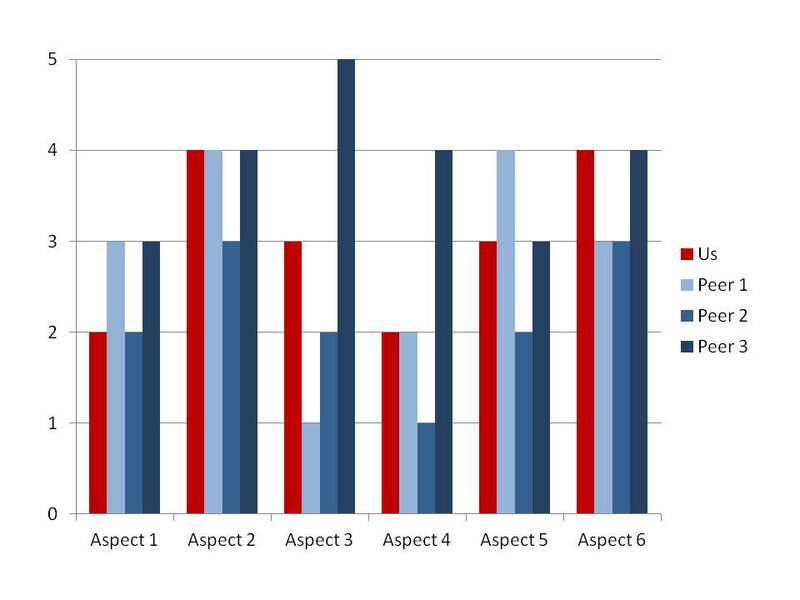 There are lots of different ways to report your performance against the maturity model. Here’s an example for an organisation that is comparing itself against three of its peers. 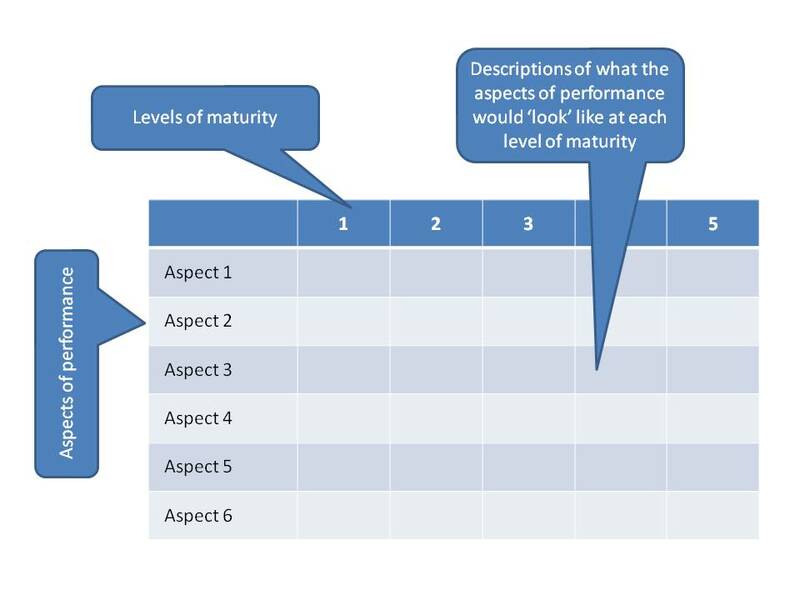 If it is just your organisation completing an assessment using the maturity model, then your assessment will highlight the areas in which you can improve and will give you some ideas for how to go about this. However, it can be much more helpful if you get other organisations (preferably reasonably similar to your own) to assess themselves, too. That way, you can compare your performance with theirs and put it into context. You can also see which organisations are doing well in a particular area and perhaps learn from what they are doing. Either way, decide what you need to do to improve (using the definitions from the maturity model) and plan how you are going to achieve them. Try to move up just one level at first in each of the areas in which you most need to improve. It’s best to start small and see concrete improvement fairly quickly than to aim for massive improvement and get disillusioned when nothing seems to change. This entry was posted in Performance Improvement, Performance Management, Performance Measurement and tagged Data, Information, Learning, Maturity Model, Peer Assesment, Performance Improvement, Performance Management, Performance Measurement, Self-Assessment by Simon Perks. Bookmark the permalink.